When you travel to or from Seattle, it is a good idea to make everything as easy on yourself as possible. From the quickest way to book your flight to the most efficient way to get from the airport to your hotel, it is all about making life simple. The simpler the process, the less that can go wrong. That is why you should consider booking Seattle airport parking in advance, and make one more step in the process easy and worry free. There are almost 30 different options for airport parking at Seattle Tacoma International Airport (SEA), so you have plenty of choices. Most of the parking lots listed here are only a few blocks from the airport itself. Seattle Tacoma Airport, more commonly known as Sea-Tac Airport, is between the cities of Seattle and Tacoma, just over a mile away from the I-5 highway. The airport serves as a hub for Alaska Airlines and the operations base for Horizon Air. Northwest Airlines does not operate a hub at Sea-Tac, but features frequent flights between Seattle and the Pacific. WiFi is available throughout the terminal, and the airport also has constantly changing art exhibits. While you wait for your plane, you can get your nails done or get a massage, among other things. For traffic information, see the Seattle.gov website. Planning a long drive to or from the airport, or an odd-hours flight? 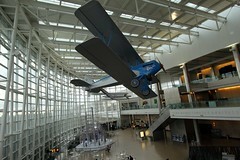 Check out Seattle Airport (seA) park and sleep hotels. Don’t fancy driving to the airport? Or leaving your car there and paying for parking? Catch a shuttle to Seattle airport.